To see the Strumbellas live is to see a band give it 100 percent, every time. They performed for the few hundred lucky people who made it into the beer garden before it had reached capacity, because it turns out this band's reputation now precedes them. This is clearly because beyond having a deep repertoire of strong songs off their two full-length albums, the Strumbellas know how to entertain. In their 45 minute set, they got the crowd to sing rounds to "Sailing," lead man Simon Ward repeatedly chucked his acoustic guitar into the air above his head and caught it (making me wonder if the band had a contingency plan), and lead guitarist Jon Hembrey descended into the crowd for a guitar solo. Somehow, they even made their sound check entertaining. 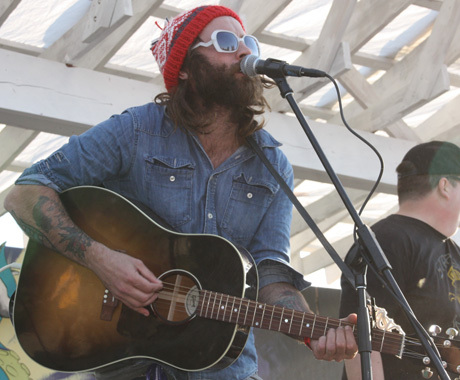 The Saturday beer garden show was the second of three shows the Strumbellas put on over Folk on the Rocks, so Yellowknifers who were able to catch them are very lucky people.